The family of an unarmed black motorcyclist who was shot and killed by a Washington, D.C., police officer in 2016 reached a $3.5 million settlement with D.C. government, the mayor's office announced Wednesday. The family of Terrence Sterling filed a $50 million lawsuit against the District and the Metropolitan Police Department in Superior Court in December 2016, alleging Officer Brian Trainer shot Sterling, 31, in the back Sept. 11, 2016, even though he didn't pose a threat to the officer or anyone else. "We can never say or do anything to bring Terrence back. But we can, and do, resolve to illuminate what went wrong and, with great determination, do what we can to ensure no family faces this pain," Mayor Muriel Bowser said in a statement. The attorney for Sterling's family did not return repeated requests for comment. Police said Sterling, of Fort Washington, Maryland, intentionally rammed the passenger-side door of a police car while trying to flee a traffic stop. Witnesses disputed the police department's account of the incident and said the crash was unavoidable. The family's complaint argued police violated general orders by getting in the path of a vehicle, increasing the chance of deadly force, and also claimed Trainer used excessive force. Trainer, a four-year veteran of the department, was wearing a body camera, but he did not turn it on until after the shooting, police said. A Metropolitan Police Department internal review board later found Trainer violated department policy when he shot Sterling and called for him to be fired. Last year, Chief Peter Newsham told News4 Trainer should resign. "What I hope the public takes from it is that we’ve done exactly what we’ve said we’d do in this investigation," Bowser said Wednesday. "We’ve been transparent, we’ve worked with federal prosecutors, we worked very openly with our own investigation. We have some preliminary ideas of what happened and think a settlement is appropriate." According to a review of the incident by the U.S. Attorney's Office and the MPD, Trainer and his partner, the driver, were stopped at a red light on U Street at 15th Street in northwest D.C. about 4:20 a.m. on Sept. 11. Sterling pulled in front of their cruiser and briefly stopped before speeding off through the red light. The officers turned on their emergency lights and siren and pursued Sterling. The officers lost sight of Sterling at times, but other officers and civilians saw him riding at speeds estimated at 100 mph, running red lights and nearly hitting another police cruiser, according to the U.S. attorney. 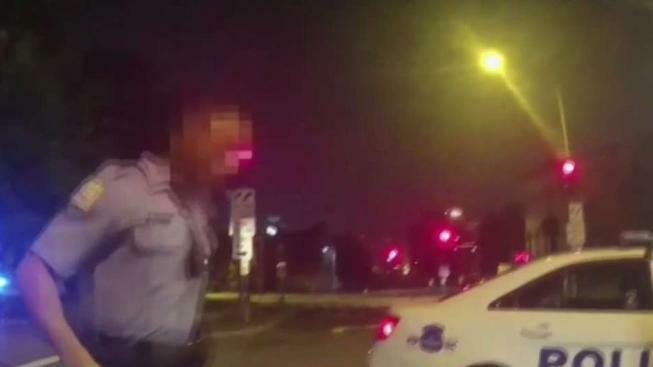 The pursuit continued for several minutes and covered about 25 blocks, until Sterling stopped at Third and M streets NW and the officers pulled into the intersection to partially block Sterling's path, according to the U.S. attorney. Trainer drew his weapon and opened his door. Evidence shows Sterling accelerated toward the passenger side, hitting the door as the officer was getting out, the U.S. attorney said. Trainer reacted by firing two rounds through the front window, according to the U.S. attorney. Sterling died of wounds to the neck and back, according to the city's chief medical examiner. Toxicology results found Sterling’s blood alcohol content was 0.16 -- twice the legal limit. Trainer did not face criminal charges in the case. He remains on administrative leave pending the outcome of the disciplinary review board's decision. "He has, according to our system, a lot of different levels of appeal and he's exercising those," Bowser said. A public hearing is scheduled for April 11 at 9 a.m.